Before your start, please make sure you have saved the XD document. 1. Open Avocode desktop app or app.avocode.com and drag & drop the XD file into any project or subfolder. Browse to select the design file you wish to upload. 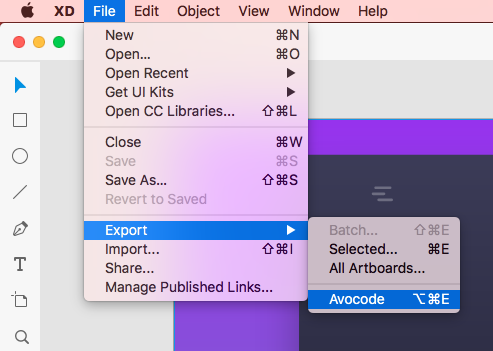 Avocode app will be launched and import the XD file into your project. How to upload a new design version? Go to the Project manger in Avocode and drag and drop the updated XD document on the preview tile of the previous version. You can also upload new versions fro the Inspect mode. Click on the version icon in the bottom left corner and hit the +UPLOAD NEW VERSION button in the left side bar. Then browse to select your XD file and sync it. New artboards will be added as new and those that you changed will be synced as a new version. How to switch between versions? We do not support older .xd formats. In case you’re having a problem with importing Adobe XD file because of its outdated format, please create a completely new Adobe XD design, copy and paste the artboards into the new Adobe XD file and save it. After you do that, it should be possible to sync the design just fine. If your design fails to be imported, looks different than expected, or something unexpected happens, please reach out to us at team@avocode.com so we can fix it. Thanks.